The Phyto Corrective Masque claims to reduce skin surface temperature by an average of 5°F, thus resolving skin irritation, redness, and other problems caused by temporary skin reactivity. This instant mask treatment is designed to help skin recover from aesthetic procedures, salon treatments, or excessive exposure to different environmental aggressors. For example, it might very helpful in case of sunburn, post workout, after sun exposure, or winter activities. The mask has been clinically tested post-procedure to effectively reduce visual redness, discomfort, and heat, caused by laser treatments, extractions, photodynamic therapy (PDT), intense pulsed light therapy (IPL), and other in-office procedures. Phyto Corrective Masque is formulated with high concentrations of botanical extracts, including soothing dipeptide and moisturizing hyaluronic acid. Dipeptide lessens the perception of heat sensitivity, while hyaluronic acid attracts moisture helps lock it in. A blend of soothing ingredients contains cucumber, thyme, and olive extracts. The mask is suitable for all skin types, but it may be extremely beneficial to sensitized and dehydrated skin. A split-face study conducted on 30 females, right after a full-face fraxel laser procedure, has shown -20% reduction in visual redness, -47% reduction in discomfort, and -5°F average reduction in skin surface temperature. The mask should be used 2-3 times a week, or as needed, as a leave-on, rinse-off, or overnight treatment. Did you know? 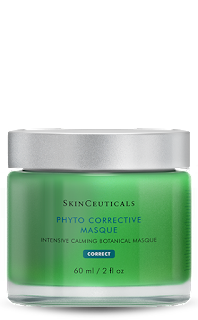 Phyto Corrective Masque is formulated with up to 9% pure active #botanicals (cucumber, thyme, & olive) with dipeptides, and hyaluronic acid which acts as an intensive calming botanical masque for temporary #skin reactivity!